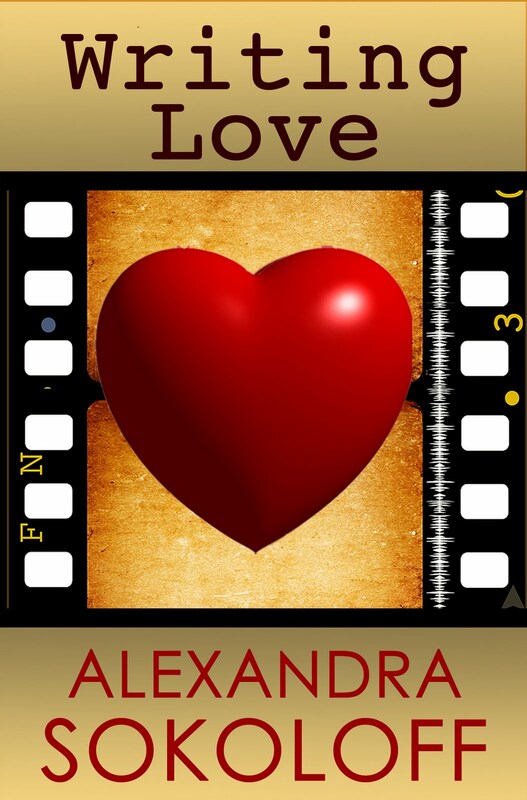 Alexandra Sokoloff: Nanowrimo: Give them Climaxes! That woke everyone up this morning, didn't it? I'm at Bouchercon, the World Mystery Convention, paneling, signing, doing interviews and of course, catching up with friends in the bar. This morning I moderated a panel called "Keep it Moving: Pace in Mysteries and Thrillers." We were discussing tricks of pacing and suspense, and I think I'll just continue that discussion here, with one of THE most important techniques of pacing I know. If you're a regular reader of this blog, you're already familiar with the Three-Act, Eight-Sequence Structure. But I still have to fill new readers in, so bear with me, or skip ahead! There is a rhythm to dramatic storytelling, just as there’s a rhythm to every other pleasurable experience in life, and the technical requirements of film and television have codified this rhythm into a structure so specific that you actually already know what I’m about to say in this post, even if you’ve never heard it said this way before or consciously thought about it. And what’s more, your reader or audience knows this rhythm, too, and unconsciously EXPECTS it - in books, which have picked up on that rhythm and evolved along with movies and television. Which means if you’re not delivering this rhythm, your reader or audience is going to start worrying that something’s not right, and you have a real chance of losing them. So today we’re going to talk about everyone’s favorite subject. You know it’s true! What’s not to like about a climax? Early playwrights (and I’m talking really early, starting thousands of years ago in the Golden Age of Greece) were forced to develop the three-act structure of dramatic writing because of intermissions (or intervals). Think about it. If you’re going to let your audience out for a break a third of the way through your play, you need to make sure you get them back into the theater to see the rest of the play, right? After all, there are so many other things a person could be doing on a Saturday night…. So the three acts of theater are based on the idea of building each act to a CLIMAX: a cliffhanger scene that spins the action of the play in such an interesting direction that the audience is going to want to hurry back into the theater at the warning chime to see WHAT HAPPENS NEXT. Many plays break at the middle, so the Midpoint Climax is equally important. This climactic rhythm was in operation for literally thousands of years before film and television came along and the need for story climaxes became even more, um, urgent. Not just because life was faster paced in the 20th century, but again, because of the technical requirements of film and television. In a two-hour movie, you have not three climaxes, but seven, because film is based on an eight-sequence structure. Modern films still follow that same storytelling rhythm, because that rhythm was locked in by television - with its even more rigid technical requirements of having to break every fifteen minutes for a commercial. Which meant writers had to build to a climax every 15 minutes, to get audiences to tune back in to their show after the commercial instead of changing the channel. 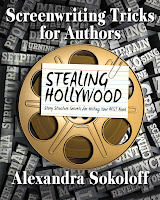 So what does this mean to you, the novelist or screenwriter? It means that you need to be aware that your reader or audience is going to expect a climax every 15 minutes in a movie - which translates to every 50 pages or so in a book. Books have more variation in length, obviously, so you can adjust proportionately, but for a 400-page book, you’re looking at climaxing every 50 pages, with the bigger climaxes coming around p. 100 (Act I Climax), p. 200 (Midpoint Climax), p. 300 (Act II Climax), and somewhere close to the end. Also be aware that for a shorter movie or book, you may have only six sequences. 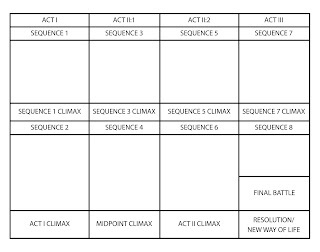 Looking at that grid, you can see that what I started out in this article calling the three-act structure has evolved into something that is actually a four-act structure: four segments of approximately equal length (30 minutes or 100 pages), with Act II containing two segments (60 minutes or 200 pages, total). That’s because Act II is about conflict and complications. While plays tend to have a longer Act I, because Act I is about setting up character and relationships, the middle acts of films have become longer so that the movies can show off what film does best: action and conflict. And books have picked up on that rhythm and evolved along with movies and television, so that books also tend to have a long, two-part Act II as well. You don’t have to be exact about this (unless you’re writing for television, in which case you better be acutely aware of when you have to hit that climax!). But you do need to realize that if you’re not building to some kind of climax in approximately that rhythm, your reader or audience is going to start getting impatient, and you risk losing them. Once you understand this basic structure, you can see how useful it is to think of each sequence of your story building to a climax. 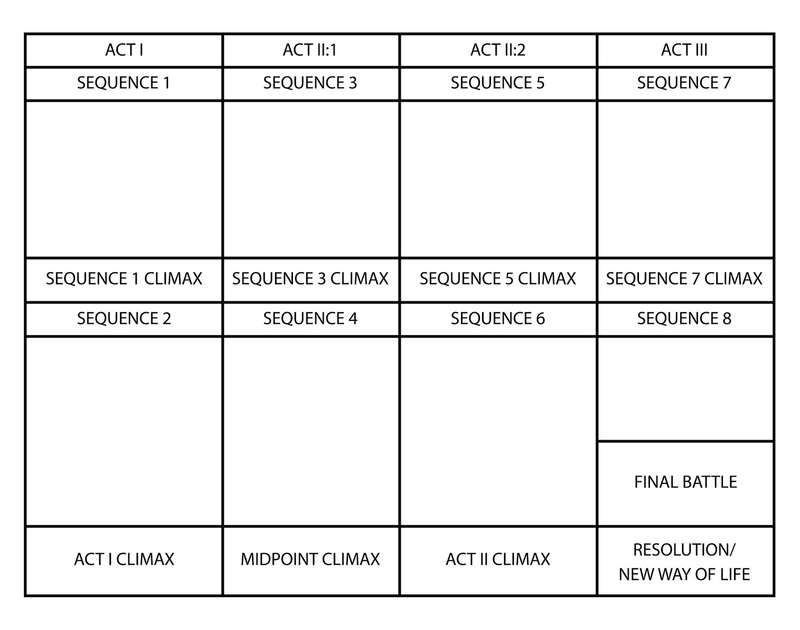 Your biggest scenes will tend to be these climaxes, and if you can fit those scenes onto the grid, then you already have a really solid set of tentpoles that you can build your story around. So here’s the challenge: Start watching movies and television shows specifically looking for the climaxes. Use the clock on your phone or the counter on your DVD player to check where these climaxes are coming. It won’t take long at all for you to be able to identify climactic scenes. Your next task is to figure out what makes them climactic! I can give you a few hints. The most important thing is that the action of your story ASKS A QUESTION that the audience wants to know the answer to. But climaxes also tend to be SETPIECE scenes (think of the trailer scenes from movies, the big scenes that everyone talks about after the movie). And what goes into a great setpiece scene? Well, that’s another post, isn’t it?